For a non-believer this is but one life, but for a believer of Hinduism, this is one of the many. This may be the final one for a self-realized yogi, or the seed for another for those in whom desires are not yet cremated in the fire of renunciation. This discussion is not about what you want to achieve in this life. It is what you want to do in your next life, or how you want to shape it. If you believe in rebirth, planning for your next life is as important as planning for your current one. Since your current life becomes the seed for your next life, your planning for your current life must be done in the context of your next life only, and you must pay particular attention to the problem of karma and how you want to resolve it. Even if you do not plan for it in detail, you must have some concern about your rebirth and how you may want to spend your future life. At least, you should be able to visualize, either as an aspiration or as a desire, what type of life you want to lead in your next birth. If you do not believe in rebirth, this discussion is not for you and you can conveniently skip this section. According to Hinduism two possibilities exist for each being at the end of this life, liberation or rebirth. The advantage with liberation is that it will end rebirth and free you forever from mortal existence. You will not be reborn even when the world ends and a new time cycle begins. However, liberation is difficult. Even if you strive hard and advance well on the spiritual path of renunciation, self-purification, and detachment, there is no guarantee that you will achieve liberation. Therefore, if you are pursuing liberation as your main goal, you must not lose sight of the possibility of rebirth and you must still prepare for it. There is a third possibility, that of falling into darker hells, which is the destined fate of the most sinful, haters of God. We are not discussing it here because if you are reading this article it means that you have past action merits, and you do not fall into the category. What happens when you achieve liberation? According to the Upanishads, when you achieve liberation, you will travel by the sunlit path or the path of light to the immortal world of Brahman. The journey said to take almost a year in earth's time as it happens in several phases over 12 months. You will be able to enter the world of Brahman only if you are completely free from all impurities. If you are unable to resolve all your karmas but perform good actions and lead a righteous and dutiful life, you will go to the world of ancestors by the gray path or the path of smoke, and return after exhausting your karmas. Your current life, thus becomes important both from the perspective of your afterlife and your next life. What part in you goes to the next world? According to the Vedas, your soul goes to the next world. At the time of death it leaves the body from the heart region in your body through an aperture in the top of your head for the mid-region (space), accompanied by the breath, and sense organs which are considered the aspects of heavenly deities. From the mid-region they return to their respective spheres, while the soul moves on along the path of either the immortals or the ancestors, according to its destiny as determined by its past actions. The soul remains immutable and pure even when it exists in the body. It is the impurities that accompany the soul in the form of past life impressions and the strength of the astral body that is built in the ancestral world by the sacrifices and the offerings made by the descendants upon earth which determine the time and nature of its rebirth. When you think of your next life, certain principles and certain aspects of your life and behavior become important. For example, you should not become too attached to your current identities, priorities, preferences, and preoccupation, and you must perform your actions with a spirit of surrender and sacrifice. Hinduism puts a lot of emphasis upon detachment and renunciation. 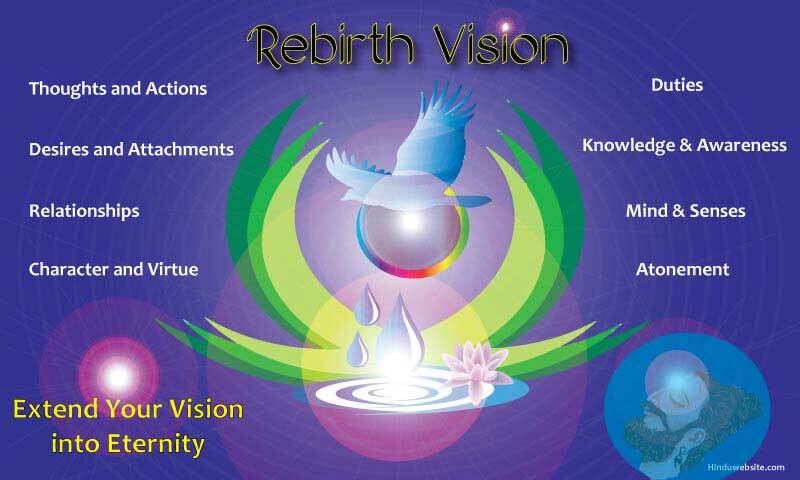 The following illustrate why they are important in the context of your rebirth or afterlife. 1. There is no guarantee that you will be born in the same family and in the same country. Therefore, becoming too attached to your current family identity or national identity, or living too selfishly for your sake or your family sake only are detrimental to you, to your next life, and to your future wellbeing. 2. You cannot be sure which religion you may practice in your next life or which language you may speak. You should therefore show tolerance and compassion towards all communities and people of all religions. 3. Your future life largely depends upon how you would perform your obligatory duties, and deal with people, relationships, gods, ancestors, animals, and other beings. You must not only act responsibly towards them but also ensure that your current actions do not cause them pain and suffering. 4. By practicing certain meditative techniques and strengthening certain memories of your current life, you can improve your chances of recollecting your current life in your next one. Remembering your past lives can have certain advantages such as resolving problems whose causes cannot be easily determined. 5. Our scriptures suggest that whatever you think of at the last moment, or at the time of your departure, will have a strong influence upon the course of your next life. By training your mind in the contemplation of God or certain sacred thoughts, you can either completely avoid the possibility of rebirth, or earn a right to enter the higher worlds. 6. If you have committed any cardinal sins in the past, atone for them sincerely, and seek the help of God through prayers or the guidance of a spiritual master to neutralize them. 7. Excessive desires and passions, anger and hatred, pride, envy, and deceit are some of the worst destroyers of happiness and the chances of a good rebirth. Avoid them by cultivating virtues such as love, compassion, honesty, contentment, devotion, detachment, and nonviolence. 8. Know that suffering is a teacher, and learning from it is the key to progress and improvement. If you learn your lessons from your current suffering, failures, and setbacks, you can avoid their repetition in future. 9. For a believer in rebirth, death is just a phase in the existence of a bound soul. Therefore, if you believe in rebirth, you should not be afraid to face death, but consider it an opportunity to make a new beginning and correct your past mistakes. Truly speaking we are born everyday, and everyday we have opportunities to be different and better. Your next life is a sum of what have done in your past lives and your current life. Karma is a continuous and never ending process. As you keep exhausting your past karmas, you keep on incurring new karma as you perform actions. As the Bhagavadgita says, it is impossible not to perform actions and avoid karma. You cannot resolve the problem of karma by action or inaction. Even if you do not engage in physical actions, your mind and body keep functioning which may result in positive or negative karma. The problem of karma is resolved only when you achieve liberation. Since liberation may not always be possible, or guaranteed, it is better to remain prepared for the possibility of your rebirth, and focus upon the following. 1. Your thoughts and actions: Karma arises mainly from desire-ridden actions. Intentions are therefore important. Understand the motivation behind your actions. Whether it is earning wealth or helping others, know why you want to do it. Karma arises from your thoughts, words, and deeds. You should therefore focus upon all the three, and learn to practice restraint. 2. Your desires: Your predominant desires form the seed for your next life. They create strong impressions in your consciousness and leave the residue in the form of causative consciousness (karanachitta). You cannot get rid of it easily without practicing detachment and renunciation. As the Upanishads declare, desire for the fruit of your actions is even more binding. Therefore, you have to see with which attitude you perform your actions and what you want to achieve out of them. 3. Your attachments: The bonds you form with the things of this world are difficult to overcome. If you do not overcome them, they will force you return to the same places and situations and deal with them. Attachments are also responsible for many undesirable traits and negative consequences which result in the continuation of suffering from birth to birth. 4. Your relationships: They are the most obvious form of your attachments. Your relationships with others, and material things in your life produce various types of positive and negative karmas. When you deal with people, it is difficult not to incur karma since your actions and their actions will result in positive and negative consequences for you as well as for them. Therefore, you have to examine your relationships, and release them from all obligations and past hurt. 5. Your character: The Bhagavadgita enumerates certain qualities that are considered divine and certain qualities that are considered demonic. They arise from the predominance of the gunas, namely sattva, rajas and tamas. Examine which quality is predominant in you and try to cultivate sattva through your thoughts and actions. As the scripture declares predominance of sattva ensures either a good rebirth or even liberation. It is also important that you lead a pious and virtuous life, without succumbing to evil temptations, selfishness, cruelty, or immorality. It is better to act according to your best discernment. 6. Your obligatory duties: Karma yoga means performing your expected duties sincerely without expectations, with a sense of responsibility, sacrifice and surrender. Your duties arise from God and they are meant to ensure the order and regularity of this world and the welfare of all those upon whom you depend for your own welfare and wellbeing. According to our scriptures, obligatory duties produce good karma. Hence, you must focus upon living responsibly and dutifully, without expectations, and do your part in the world of God. 7. Your knowledge and awareness: Cultivating the right knowledge is important to overcome the delusion and discern the truth about your own existence and the existence of this world. When you have right discernment, you know that you are neither your mind nor body but the eternal soul. You become aware that you are but an instrument of God meant to perform his duties upon earth. You also come to the realization that you cannot take credit for your actions or achievements or claim ownership of your wealth. Right knowledge comes from the practice of yoga, self-purification, and study of the scriptures. You can also learn from the wisdom of enlightened masters. 8. Your mind: It is very difficult to train your mind and regulate its movements. As stated before, having control over your mind is important because our scriptures suggest that whatever thoughts that predominate your mind and prevail in your awareness at the time of your death determine your next life or liberation. You can gain control over your mind only by restraining your thoughts and senses and by practicing meditation and concentration. 9. Atonement: The best way to neutralize your negative karma is by atoning for it and resolving not to repeat the actions that produced it. In some religions you have to go to a third person and seek his intervention for your atonement. In Hinduism you can do it by yourself by praying to God or your personal deity. You can also perform certain rituals with the help of trained priests to cleanse your sins, but it is not always necessary. Make it a habit to atone for your sins every day before you go to bed. Let your prayers be prayers for the atonement of your sins. You can also atone for your past sins by performing good deeds, such as giving charity, helping the poor and needy, contributing to social or religious causes and so on. Unfortunately, even though many people believe in the possibility of rebirth and reincarnation, most of them do not show much concern about it or feel responsible for it. They become so absorbed and involved with their current lives that their thoughts do not go beyond this life or this planet. The attractions of life are such that many are naturally drawn to them, and become involved with them. In the process, they become attached to their current identities, families, nationalities, communities, religious identities, relationships, possessions, achievements, and professions and regularly engage themselves in actions to fulfill their current desires and resolve their current problems. Ironically, nowadays Hindus are excessively becoming attached to their faith and religious identity, although the scriptures suggest that their current existence is but a phase in the journey of their souls and they must transcend their identities to stabilize their minds in their eternal Self. It is time we extend our vision and look beyond this life or view it in the context of soul's eternal existence. Sanatana Dharma teaches you that when you plan for your current life, you must also plan for the next. You must either seek liberation or plan for a better life. Human life is precious and a great opportunity to improve the quality of your existence or return to your source. Therefore, you have to think beyond your current life and relationships, and live more responsibly and virtuously, knowing how your thoughts and actions may create your future life. Since as a believer in karma you are aware of the consequences of sinful actions, you should not live selfishly or pursue evil desires. To free your mind from past life impressions, you should transcend your attachments and concerns for your identity, nationality, religion, relationships, achievements, political beliefs and ideologies, possession, status, etc., and as you understand the importance of virtue, you have to show compassion and consideration for others, act charitably, and conduct yourself humanely or righteously. In short, let this life be a part of your journey into eternity and infinity.